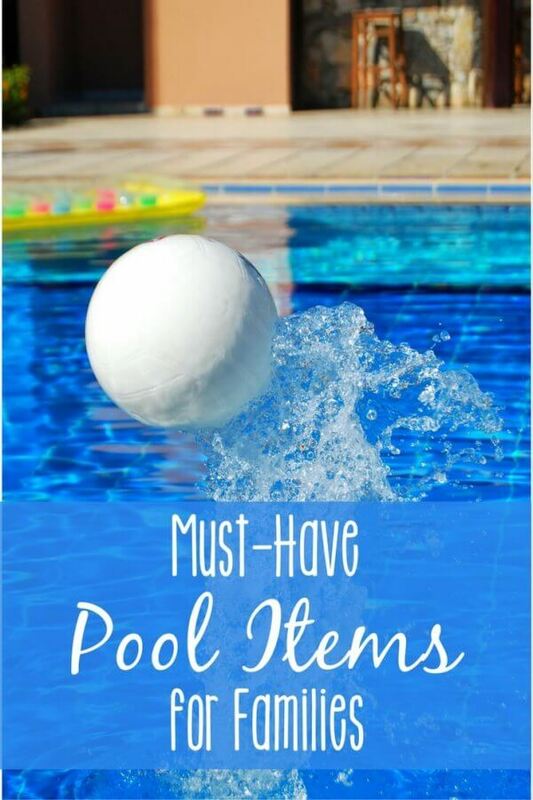 You are here: Home / Kids & Family / Don’t Miss these Must-have Pool Items this Summer! It seems that even the areas of the country that get out late are officially out of school… which means it’s pool time! My family hasn’t been able to get to our neighborhood pool more than a couple of times yet, but it’s technically not even summer until later this week, right? 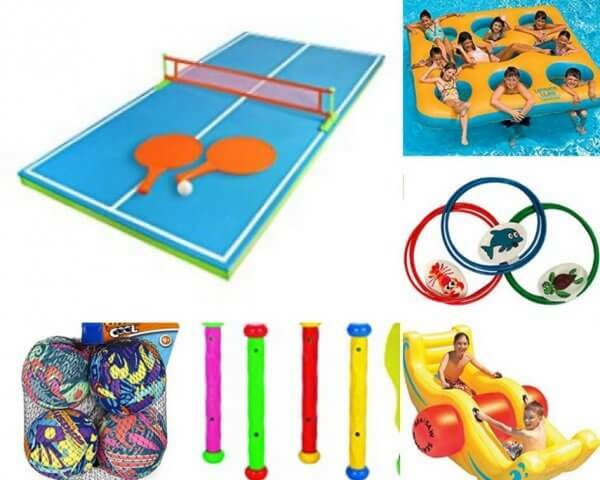 If you have access to a pool – whether in your own backyard, or in your neighborhood or community – you definitely need to check out these accessories and toys! Water Bomb Splash Balls – I have no idea why these balls, which are basically like little sponges, are so much fun… but they are. They’re a favorite of ours every year! Diving Rings, Sticks, etc – My kids each seem to have a preference on which diving toy is more fun, so we tend to have a variety. Swim-Through Rings – These have been especially fun as my children have learned to swim underwater. We like to use them for a race! Inflatable Pool SeeSaw – We haven’t tried this one yet, but we’ve had other inflatable toys from the company. This looks like fun! Multi-Opening Inflatable Float – This “island”, another product from Swimline, is a great way to hang out as a family, if your pool is big enough! Floating Ping Pong Table – We’ve had a number of regular-games-turned-pool-toys in the past, but none so fun as ping pong. The need to float, the “jumping” for well-placed hits, etc lead to a ton of laughter. Swimways Drink Dock (or similar floating drink holder) and a Floating Cooler – This one is fairly self-explanatory. Floating Sofa – I’m not sure how practical this one is for a community pool, but if we had one in our backyard you better believe you’d find me sitting on this a lot. Baby float –When my daughters were little, they had the sweetest ladybug and frog floats. This one isn’t quite as cute, but the addition of the canopy is an excellent trade-off. Floating Speaker – This Bluetooth-enabled speaker that floats in the pool is definitely a must-have for a music loving family. If you have the ability (or should I say right?) to crank the music up much louder to where you can leave a speaker poolside, then my vote goes for the waterproof version of the Oontz angle. We have these in our showers, and can’t recommend them enough for anywhere else where music and water may mix. GoPro (or other underwater camera, or camera housing) – We have used our GoPro more underwater than any other place. It wasn’t intuitive to learn though, so I can’t wait to get my hands on the new GoPro Session later this summer! Reefs Flip Flops – Most styles have a bottle opener built in, plus they’re incredibly comfortable and supportive. What more could you want in a beach or pool shoe?! Puddle Jumper – My kids have absolutely never felt comfortable swimming in traditional life jackets. They’ll wear them, especially when canoeing, etc, but they always seem to be pretty inhibited by the way they make them float. All three have loved their puddle jumpers, though! 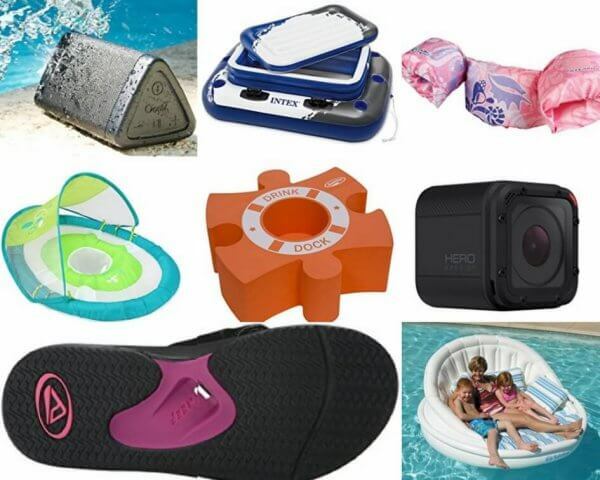 What is YOUR must-have accessory this summer when you’re hanging out at the pool? Previous Post: « Cars 3 Review: We didn’t need it, but it’s nice to check in on old friends. Love all the suggestions! My boys would love the floating ping pong table for sure!